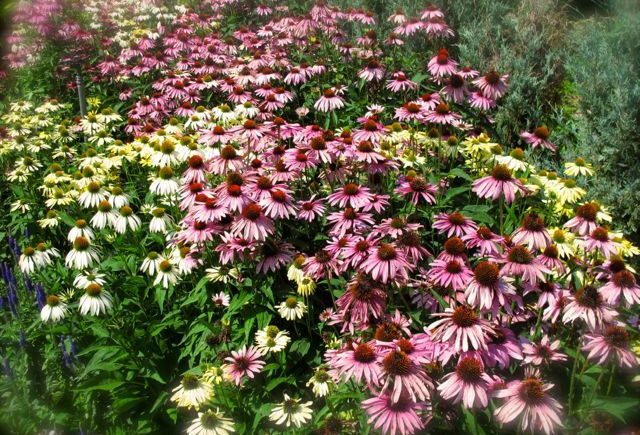 I’d call this a jubilation of purple (and not-so-purple) purple coneflowers (Echinacea), wouldn’t you? 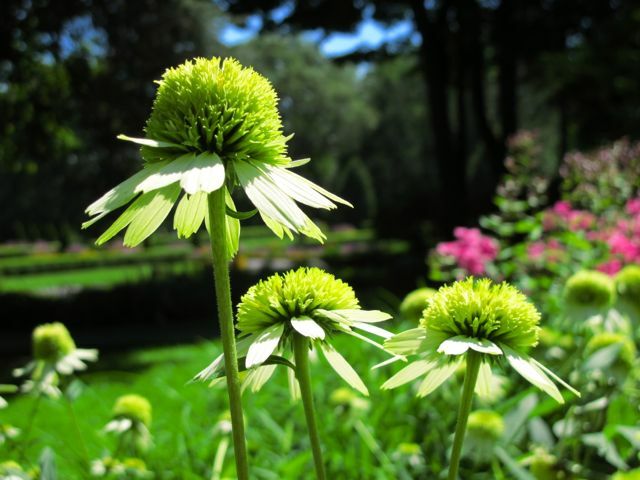 From mid-July into September, purple coneflowers (Echinacea) are among the bright stars of the garden. 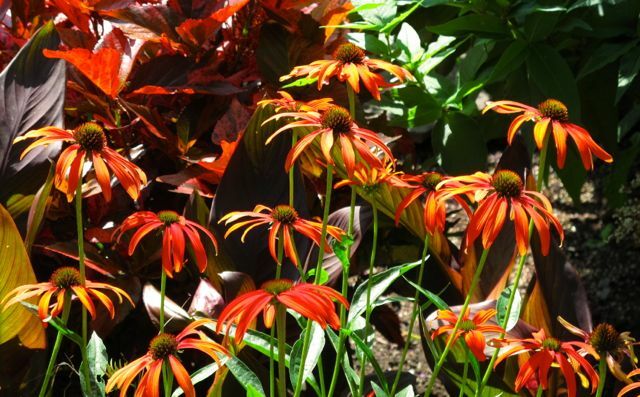 Long-lasting and fairly easy to grow, on well-drained soil in full sun or light to part shade, they are a great flower for beginning gardeners. What’s more, bees and butterflies love them. 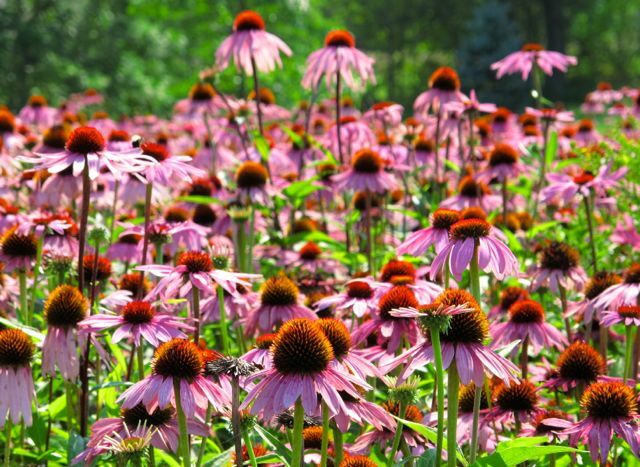 Many species of Echinacea are native to different areas of North America. 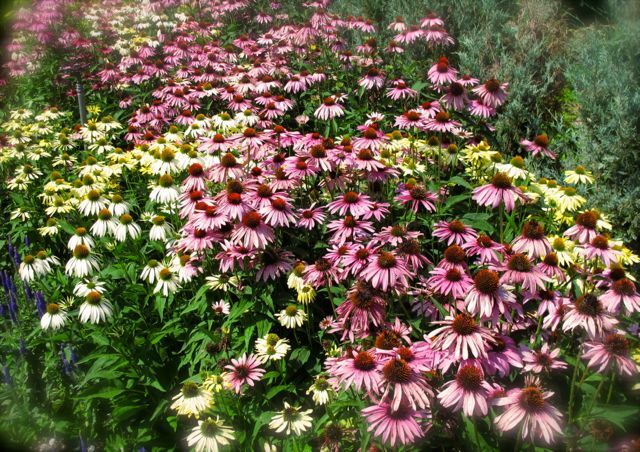 However, most of those you’ll find in garden centres are nativars, or selected cultivars derived from the native parents. 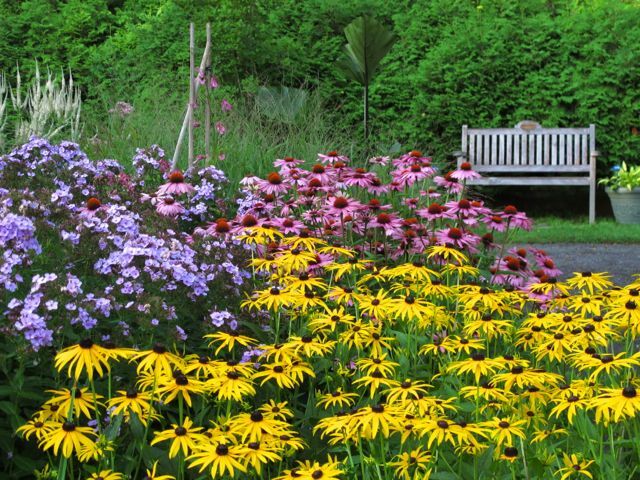 Purple coneflowers play nice with other late-summer flowers such as phlox, black-eyed Susans (Rudbeckia) and, off to the left in the background, culver’s root (Veronicastrum). You can add just a few. Or, you can have a field day with them. In a whole field. 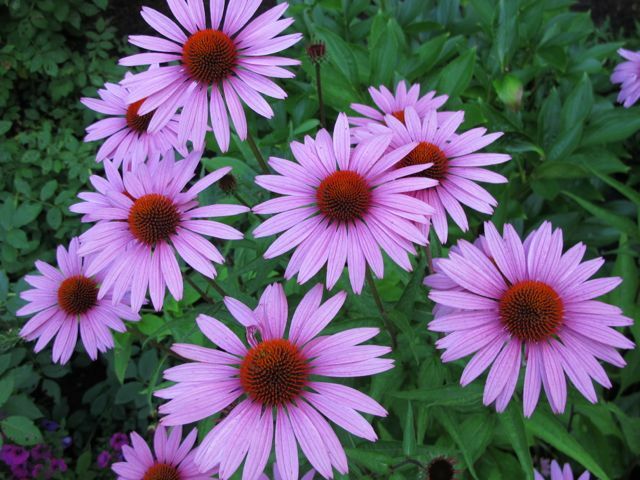 The droopy, narrow petals of Ontario’s native pale purple coneflowers (E. pallida) remind me of old-fashioned ballet skirts. 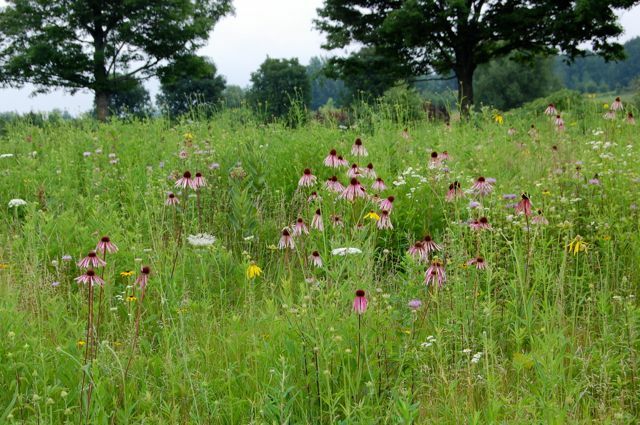 Yvonne Cunnington’s meadow (above) was planted with help from Wildflower Farm, from whom you can purchase seeds for a number of species, including our pale purple coneflower (E. pallida). 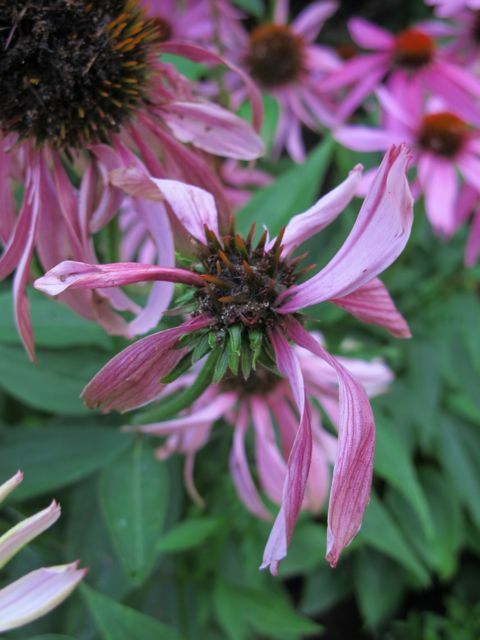 Although easy to grow, Echinacea can fall prey to diseases, and among the most disfiguring is aster yellows caused by a bacterium-like organism called phytoplasma spread by leafhoppers. Read more on this and other problems here from the Alberta ministry of agriculture. 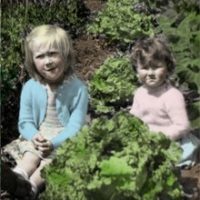 If you see it on your plants, dig them up and destroy them, don’t compost. 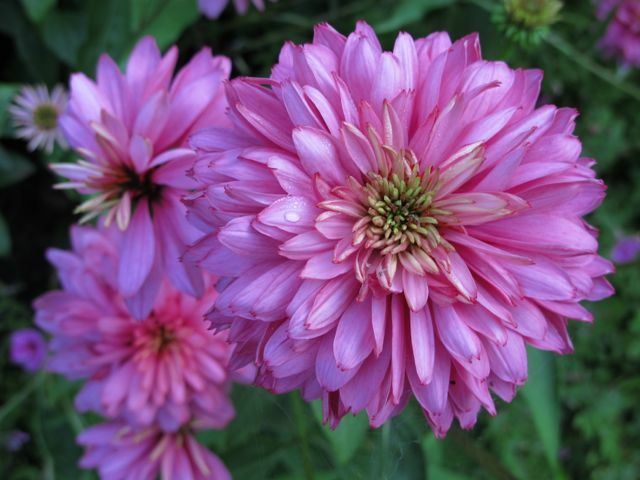 But don’t let the possibility of disease prevent you from giving these lovelies a try. Simply stunning photos! I grew some from seed but I have the worst luck with them. I think its our wet weather. I will try planting in a hot dry site next. Hot and dry is a good location for them, Kristin. 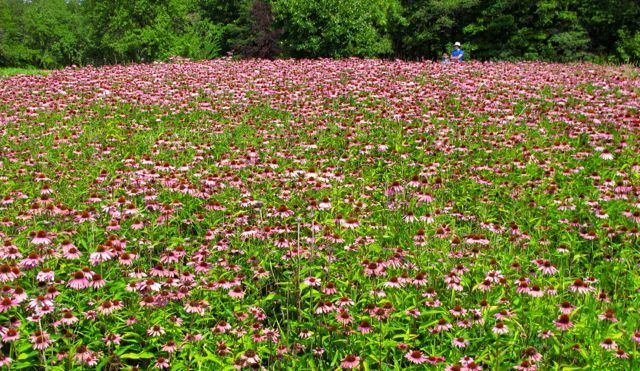 They're the perfect plant for the prairie style. Thanks, Jodi. The only IDs I'm sure of, the first because it was labelled and the second because I was told, are 'Meringue' and E. pallida — happy to defer to anyone with more accurate knowledge. Dilute one tablespoon of vinegar in one gallon of water and use to treat fungal infection on any type of plant. 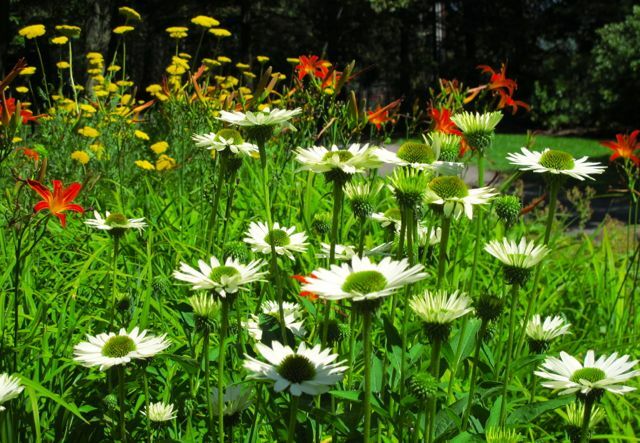 It can also help treat black spot on aspen trees and on roses. I know this works well for powdery mildew. Unsure it would be as effective for some of the heftier fungi. However, it's an inexpensive experiment to try.